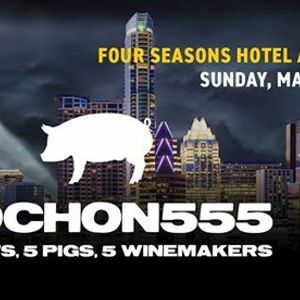 Four Seasons Hotel Austin will play host to an all-star cast of chefs who specialize in whole-animal cooking paired with farmers responsibly raising delicious heritage breed pigs when Cochon555 returns to Austin on March 31st. The all-inclusive feast will feature a hundred-plus prominent chefs, farmers, sommeliers, distillers, brewers and barkeeps all working in concert to create luxurious moments that educate the palate. At the heart, Cochon555 aims to create moments of inspiration, and to engender discussion and action – to buy, to cook, shop and donate in the name of safe, honest, and delicious food. 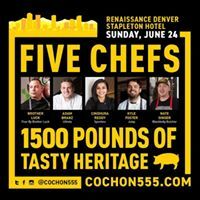 The competing chefs are a cutting-edge group from across the city, and each will be cooking one whole heritage breed pig raised by a family farm to create a maximum of 6 dishes for competition. With dozens of bites from iconic local chefs, boutique distillers, and artisan winemakers, the event is akin to an epic tasting menu of heritage breed pork with endless beverage pairings taken standing up. To win the friendly competition for a cause, a chef’s menu must woo twenty celebrity judges with their “Judge’s Plate” scored on utilization; technique; and overall flavor and be voted “best bite of the day” by guests. 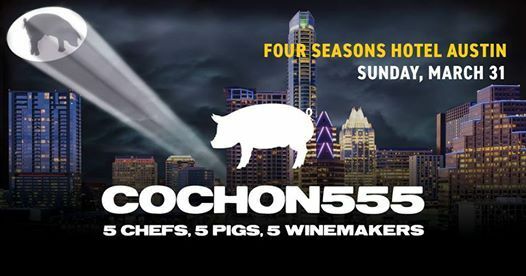 The winning “Prince or Princess of Pork” in Austin will advance to the North American finale, Grand Cochon, a head-to-tail, winner-takes-all showdown for the crown in Chicago on September 15. Additionally, running in tandem with the tour are a pair of internal competitions - Punch Kings, a whole-bottle punch bowl competition featuring Breckenridge Bourbon and five of the market’s top barkeeps, and Somm Smackdown, a face-off of the nation’s top sommeliers pairing the best wine with heritage pig. A portion of all event proceeds will also benefit the Piggy Bank initiative to support local farms. Start celebrating the night early and treat yourself to the VIP experience with an extra hour of extravagance; get up close with the chefs, winemakers and farmers who make it all happen. Chefs serve up two preview dishes to entice your palate while professional bartenders and sommeliers bring their best game forward with specialty cocktails at Punch Kings and reserve wines from Somm Smackdown. A unique signature three hour culinary experience of delight and wonderment. Feast on responsibly raised heritage breed pig, ethically sourced food, a variety of beverages from local craft breweries, distilleries and wineries, all created by some of city’s most forward thinking food and drink leaders. The ultimate aim of Cochon555 is to provide education to chefs and consumers and create experiences that guests can sink their teeth into: honest food from real farmers. The goal is to raise the bar on building a sustainable and profitable relationship for brands and chefs participating in culinary festivals. Placing the spotlight on “knowing where your food comes from," each event features an educational whole animal butchery program called the Pop-Up Butcher Shop and Silent Auction to benefit charity. Piggy Bank is a start-up farm in Missouri that serves as a kickstarter for new family farms and a safety net for those in the wake of a disaster (flood, fire and disease). As an accelerator, Piggy Bank supplies piglets to small farms in exchange for business plans that are posted online in the name of transparent “open-source agriculture”. Dishes for the competition are just the beginning -- all in, we’re talking about 1,500 pounds of responsibly raised heritage breed pork and dozens of delicious drinks from some of the best bars in Austin!